I have a rails app that I am building using foundation. I have an orders index page that displays all the users current orders on a nice looking table. (ecommerce stuff). This table displays the orders current status (in processing, shipped, etc) the order number, the address, etc etc. The furthest left column is an 'Options' column. Within that column I would like the user to have the option of viewing the order, editing the order, or deleting the order. I would still like the user to have access to an options column and be able to easily manipulate this list of orders, but Id like to make it more elegant, minimalistic, and obvious. From a design standpoint do you have any suggestion on a technique I can try to spruce this page up? Having that many icons repeated for every row seems wasteful and confusing. If you expect a user to want to apply an action simultaneously (or in quick succession) to many rows, many applications use a single column of checkboxes to select rows to be acted on and then one set of separate buttons to choose an action to apply to selected rows. Another approach is to remove the column altogether and present the choice only after the user has selected a row. You then need a different way to inform the user that rows can be selected and acted on. You could have drag targets with hover-text to reveal their operating method. 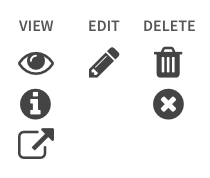 Icons for expected actions aren't a bad thing. They will save space, but they aren't technically the most "minimal" solution — that would be text, since you remove the extra layer of translation. If you do go with icons, you need to make sure they are the expected ones. Yours are not. The basket is a less common version of the cart icon which is understood as a link to your currently active cart. The pencil on a page isn't too far off for edit, but including a rectangle (or page) indicates a message or document edit. The outward-four-arrows is used to indicate full screen mode, definitely never delete. Here's what comes to mind when I think of these functions. And yes, the text at the top is one of those options. Best UI for an HTML table. Displaying package comparisons for mobile?